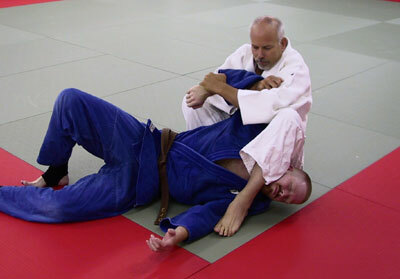 The Kodokan Judo technique Ude Hishigi Juji Gatame is commonly called juji gatame, or cross armlock. It gets its name from the position of the person doing the technique (tori) across the opponent's body. It is one of the most effective armlocks in judo, and it is consistently the number one winning armlock used in international judo competition. 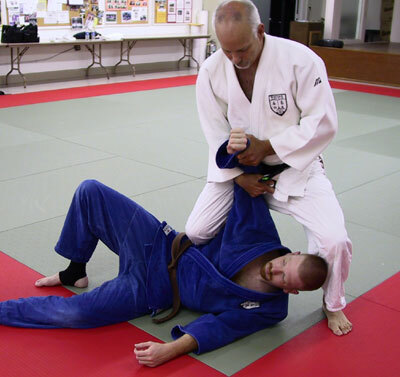 It is equally effective when used for self-defense, and the technique is included in many modern and traditional jujutsu systems. It is particularly powerful because tori is using the entire body, including the strength of the legs and hips, to control the person receiving the technique (uke) and to apply tremendous pressure to the straightened arm. For this reason it can be done against much larger or stronger opponents without difficulty. For the same reason it is also potentially dangerous and should only be practiced with proper safety precautions and instruction. There are many variations of juji gatame done from different positions and angles, and numerous entries to the armlock from various opportunities. These include variations done when uke is between your legs and you are on your back, turnovers from the hands and knees position, and the flying juji gatame done from the standing position. The basic version shown below was included in the kata of Kodokan Judo grappling techniques (katame-no-kata) by the founder of judo, Jigoro Kano. It is shown below by Neil Ohlenkamp on Jerrod Wilson. 1. Beginning in the most common position gained after completing a successful throw, tori drops his right knee onto uke to begin controlling him and to prevent him from turning towards tori. The left knee can also be used for this purpose on the head. Both hands control the arm of uke with one forearm placed on the elbow of uke. 2. Tori begins to get better control of uke by squatting, and pulling the elbow of uke tightly onto the chest of tori. Tori also places his left foot over the head of uke so that uke will not be able to sit up. 3. Tori sits down very close to the shoulder of uke so that the arm of uke is still controlled by the body of tori. The elbow of uke must be on the abdomen of tori in the final position, so sitting close under the elbow is essential. Tori pulls the elbow of uke strongly with his right forearm. 4. Tori begins to lean back keeping constant pressure on the arm of uke and squeezing the knees together to control the shoulder. Using the legs, tori should be able to keep uke down even without applying the joint-lock pressure. At this point tori makes sure that the thumb of uke is pointing up so that the pressure will be applied towards the little finger side of the arm. 5. In the final position uke taps to submit from the pain in the elbow joint. The submission should come immediately when the arm is fully extended. For additional pressure tori can lift his hips by bridging, but this must be done slowly and carefully because it may result in dislocating the elbow. 6. The hand position can vary from the standard position of both hands grabbing the wrist of uke. In this version tori has his arms crossed with the forearms controlling the wrist of uke. This is useful when uke is fighting the arm extension and tori needs to use the power of his body to pull. 7. 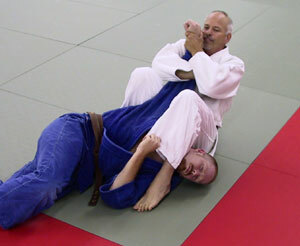 Another common version of this technique is done with both legs placed over uke to further limit his ability to roll up onto tori. 8. A strong variation is to cross the right foot over the left and to pull in with the feet. This will help to control the left arm of uke, and to prevent uke from pushing the left leg of tori off his head in an escape attempt. There are many opportunities for applying this armbar while grappling, but the key is always to control the opponent's body, and particularly the elbow, throughout the application of juji gatame.